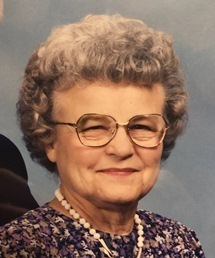 Gladys Opal Clegg, 98, of New Martinsville, WV passed away on Wednesday, February 21, 2018 while at Summit Acres in Caldwell, OH. Gladys was born October 7, 1919 in Proctor, WV; daughter of the late Wolsey and Pearl (Bohrer) Baxter. She was a homemaker, business owner with her husband, Clarence of Clegg’s Market in Proctor, WV, a twenty year retiree glazer for Corning Glass in Paden City, a past member of the American Legion Ladies Auxiliary in New Martinsville and a lifetime active member of the First Church of God on Russell Ave in New Martinsville. In addition to her parents she was preceded in death by her husband, Clarence Clegg (1995); two daughters, Reta Suter and Ruth Westfall; three brothers, Clarence Baxter, Joe Baxter and Charles Ray Baxter; two sisters, Thelma Meadows and Betty Cross and a grandson-in-law, Don Hess. Surviving are her son, Raymond (Bonnie) Clegg of Caldwell, OH; five grandchildren, Nathan (Sandy) Westfall, Matthew (Cindy) Westfall, Daniel (Alyssa) Westfall, Heather Rae (Rob) Blake and Hilary Rene (Howard Henry) Hess; ten great grandchildren, Audrey Blake, Abby Blake, Anna Blake, Ava Blake, Dereck Hess, Derek Westfall, Michaela Westfall, Rachel (Josh) Perkey, Dylan Westfall and Eale Westfall; three great great-grandchildren, Noah, Caleb and Kapelyn Perkey; son-in-law, Joel Suter; sister-in-law, Helena Baxter; brother-in-law, Bill Cross and several nieces, nephews and cousins. Friends received 3-7 p.m., Friday, February 23, 2018 at the Jarvis-Williams Funeral Home, 1224 S Bridge St., New Martinsville, WV. Funeral service 11 a.m., Saturday, February 24, 2018 at the First Church of God, 255 Russell Ave., New Martinsville, WV with Pastor Russell Whitener officiating. Family is requesting memorial contributions to be sent, in Gladys’ name, to First Church of God, 255 Russell Ave., New Martinsville, WV 26155. To send flowers to the family of Gladys Opal Clegg (Baxter), please visit our Heartfelt Sympathies Store.